"Certain beings have cast a shadow over the Earth, seeking to destroy the Life in it. Their gloomy intention is scattered across different biopolitical centers of power disguised in speeches and actions which move to yield to this crime. There, where their masked agents act, almost incurable epidemics have been gestated. These masked agents are very professional, highly competitive, and have decision-making power: they are politicians, technocrats and sorcerers. Some of them do not even know where the power that keeps them acting and dominates them comes from. Only a few quite know to which power they obey.This situation is so terrifying, that a few months ago the Kogi Mamas, the Harmony Guardians of the Earth, considering that their efforts to promote the Harmony of Life are almost useless, were a stone’s throw from defusing this sacred place, thus generating the final catastrophe. The Harmony Guardians of the Earth met in that sacred place of our Mother Earth to agree on a final decision. The great majority thought that we have already reached the point of no return, and that the most advisable was to favour the hecatomb, once and for all, given the gloomy disaster generated by the Children of the Earth regarding Life. In four previous Lifecycles, the Sacred Beings are the ones who have decided to turn the world over, thus propitiating a new creation. It is true that we are on the verge of a fifth universal catastrophe - all the natural signs of Life show this, just as it has been heralded in the sacred messages revealed to us, but it is not us, the Harmony Guardians of the Earth, who are to bring about the final catastrophe. This decision is a sacred plan of the Sacred Beings and it is their deed to carry it out. Our deed is to continue with our sacred commitment to Harmonize the Life of Mother Earth. The Harmony Guardians of the Earth unanimously proceeded to consulting the oracle in order to find out which of the two choices was the right one. The decision came out to be continuing with the sacred virtue appointed to them as Harmony Guardians of Life in Mother Earth. There is a very sacred virtue that vibrates and emanates from the Heart of our Mother Earth, a vitality that pervades every existing thing. Similarly, a sacred ancestral vitality vibrates and emanates from the Heart of Heaven, a virtue which kindness permanently invigorates every existing thing. These sacred mysteries are immanent to Life, and the power of renewal, healing and harmonization never cease to bestow upon it. From the Heart of our Mother Earth, a luminous and glittering energy spreads in all manifestations and expressions of its own Life. From the Sky, the power of the great mystery of the Sun Light, and of all luminous beings, reaches all manifestations and expressions of Life in our Mother Earth.Amongst these virtues of Light, lies that gloomy breath which casts a shadow over Life seeking to destroy it. Its purpose is to encourage action to such an extent that the luminous radiance emanating from Heaven and Earth into the spirit of human beings and their nations is overshadowed, thus promoting and forcing more crimes against Life. In order to fully accomplish its purpose, this shadow’s agents resort to all possible and imaginable methods and techniques: biopolitical, mass media, economic, technocratic, virtual, military, religious, ritualistic… at the same time ancient, modern and post-modern. In this way, a gigantic device of apprehension is unfolded, which triggers mechanisms to trap spirits, minds and bodies to set them to work and act according to their darkest powers, fully convinced that the right and proper thing is being done. The curious thing about this novel device of apprehension is that the vast majority is unaware of the manipulation they are subject to. The consequences are nothing less than the immense disaster caused to all of Nature, to the spirit, the mind, bodies, to culture and society. Given all this, can we still be proud of the humanity we are part of? Perhaps, we could rather feel ashamed of our cruel humanity: shamed by the vast forests we have mutilated and all the life that tries to survive in them; shamed by the waters we have devastated and contaminated and the life that is dying in them; shamed by the Earth’s broken mantle and the devastated ozone layer; shamed by the air pollution and the life it poisons and kills; shamed by the misuse of fire; shamed by all the homicides, assassinations, holocausts and wiping out of ethnic groups daily perpetrated.The wizards of war have to do with all this. War is not only the endless clashes and armed aggression; war is any act that threatens the Harmony of Life on our Mother Earth. And Peace is not just the cease-fire of the clashes and armed aggression, but the cease-fire of any sort of war against Life. Peace is finding the virtues of brotherhood, understanding, of respect for all differences, respect for all manifestations and expressions of Life in our Spirit and in our way of living. The human population is one of the majority species in the Life of Earth, outnumbered by species such as cows and ants. Will we be able, with the human paradigm that we have primarily formulated, change this degree of ecological disaster we have caused? Perhaps with this human paradigm we will only achieve temporary palliatives which will prove insufficient for the healing and recovery that the Harmony of Life on our Mother Earth requires. This urgent task requires more than just a paradigm shift. It requires abandoning the consuming human paradigm. It requires building a new spirit, a new mind, a new body… new ways of existence. As we face this global disaster, this imminent catastrophe, we need to Return to Life as something Different.The ancient wisdom of native peoples tells us that the history of Life on Earth has gone through four, some say five cataclysms, after which Life was completely and radically renewed *. According to these traditions, we have reached the end of the transition period, so that a new Age will emerge. The shift of ages has always been marked by a global cataclysm due to a widespread crisis. And the final moment of each transition period allows us to discern what will happen in the future. The only certainty we can have is that this present is already an archaeological vestige of a past which will have nothing to do with the coming future. The small benevolent upswings that we are experiencing today here and there are merely the last socio-cultural phenomena that will eventually favor the advent of a future that will have nothing to do with the paradigms established until now. Perhaps we will no longer be human beings, just as in the preceding era we were urged to being hominids no more and grow into something better. Perhaps we might return in a different form: such as we had to abandon the hominid condition in a previous age, reinventing ourselves as human beings in order to survive during the present age we will have to abandon the current human condition and it's devastating nature and create a post-human condition that respects all life and its surroundings if we wish to survive in the immediate coming age. Everything is possible for the force of will of a body; a body can achieve anything when it wants and desires a new possibility of Life, and much more when new conditions of Life demand it. If a Cro-Magnon or a Neanderthal man could see us today, they might not be able to recognize us as their relatives. Today we look at our children in amazement and we acknowledge spiritual and intellectual skills we lacked when we were children and still lack as adults. We have a great responsibility to our children. They clearly see everything we do, and consciously decide whether or not they will repeat what we, their parents, have done; they will even consciously decide whether or not they will accept us as their parents. Each of our actions has repercussions and consequences during the following seven generations, and similarly for the next generations that follow. And always, much more in this transitional period, there is much to do and to decide. We can allow ourselves to be trapped by this device of apprehension that casts a shadow over Life seeking to destroy it, or we can, if we want, attune with the luminous energy emanating from the Heart Of Mother Earth—and with the Light of Life which emanates from the Celestial Being—to avert the sorcery of the catastrophe, so as to pass through it, into infinity. This is neither a new practice of resistance, nor a struggle. This is a matter of a new mode of existence that attunes us while uniting us to the new possibility of Harmonizing Life in the same context as the imminent catastrophe, after which Mother Earth will give birth to a new possibility for her Life. The shamanic traditions and practices of our Mother Earth have always done it this way. Today, more than at any other time, it is urgent and necessary to join and to close the Sacred Circle of the knowledge, the traditions and the shamanic and spiritual practices of our Mother Earth around the sacred purpose of Harmonizing Life. Thus is being done and thus will be done. * Contemporary biology concurs with these ancient traditions, stating that we are on the brink of the sixth extinction of life. Richard Leakey and Roger Lewin. The Sixth Extinction: Patterns of Life and the Future of Humankind. Ba Brcelona: Tusquets Editores, 1998. Kajuyali Tsamani – Wichapishinteton Luta – Mama Nabi. The Mamas’ work is performed at what they call ‘sacred sites’. These are the places where they have direct contact with the “spiritual parents”, who they describe as the Mothers and Fathers of all living things. These are aspects and personifications of aluna. Now the most important sites are themselves being destroyed. The most vital of these places are the eizuamas, extremely delicate locations high in the Sierra Nevada which they believe most immediately connect with specific parts of the life-energy underlying nature. The manipulation of this communication involves engaging with precisely placed stones, tiny offerings and small precious beads, tumas, which unfortunately now have some commercial value. The eizuamas are out of bounds to visitors and are protected by hereditary lineages of Mamas whose lives are intimately bound up with the sites – the “spirit of the place” is expressed directly to them. Now the eizuamas are being destroyed. At the core of the Mamas’ understanding of the world is their belief that the mountain itself and its sacred sites are living and fully conscious. as are other key parts of the planet. They are now certain that if we cannot be brought to understand this, then everything is doomed as we shut down the life-energy of the world. That is the key to the despair that follows. I am Mama Pedro Juan, speaking in Seishua. Here we are on Planet Earth. I want to tell you that we all live on the same planet, and so we must all listen to the commands of the Mothers and Parents who grant us the Earth. The Sierra Nevada is itself the natural law that keeps the world alive, and is fully awareNulkukeje (the essence of the Sierra Nevada) is a Lord who knows the whole of the Law. The Mother told him that he is in charge of manifesting her thoughts. Nulkujaluwa (the Sierra Nevada) is the material manifestation of the Law. Our place is here taking care of it. She said that the whole of the Law of Nulkujaluwa is contained in nature itself. Seishua (this sacred site) was also created by the Mother and knows the whole of the Law. It must warn those who are thinking of doing harm so that they understand that they cannot destroy the seas and everything that exists. They are not the owners of the world. There is a high environmental authority, which takes the form of a high mountain, which keeps watch against the intrusion of disruption and corruption. Now we find ourselves in contact with the enemy of the mountains. The mother gave form to the spirit-essences of the mountains so that they would protect us against everything harmful. From the beginning they were ordered to take care not only of all the foods of the Earth, but also of women and of children, who are the future. Nulkujaluwa also shares this responsibility, and I know is the Father responsible for the defence of knowledge and protection of the Younger Brothers. That is what the Mother ordained All species, all creatures and all plants, have their Mothers and exist under the authority of Laws, and the whole of the Law is expressed in the Heart of the World. The Mother gave us physical form, with a heart so that we might live, and ordered nature in the same way. Now we are destroying every type of vegetation and the Mother feels this like an amputation, or tearing out her heart. To that extent the Mother is like us. Our Elders know this. Our ancestors taught to us that the forests cannot be felled. There are trees that cannot be cut. That rule has existed from the origin and protects the Fathers and Mothers of nature from generation to generation. These trees still exist. We understand the physical reality of Nulkujaluwa. Kuibis (Mamas who live in the dark) that do not eat raw salt or conventional food, are the most important observers of Nukujaluwa. We listen to them and know that the armed groups that are now here are making nature itself sick. The Younger Brothers also have their eizuamas, and some of them do prepare themselves, though in a different way. I believe that it is important to do this, and not only do it in theory but also in practice, and I want the Younger Brothers to listen to what we say and not continue causing damage, or nature itself will finish us off. That is why we speak to the Younger Brothers. Originally there were no strange things like airplanes intruding, and this intrusion has an effect on nature. We must also tell you that tuma (ancestral divination stones) must not be taken out of the ground. We behave respectfully but the Younger Brothers do not. As soon as they see something in the earth they grab it. They are taking advantage of the frailty of nature, and the Mother does not resist, but… This is what we Mamas of the Sierra Nevada want to make clear to the Younger Brothers. The birds have gone from us, because the Parents of Teyuna (the humming bird, the Lost City and the spirit guardian of the tumas) have been taken. Everything that exists on earth exists not only in eizuamas, but in all the sacred sites right down to the beaches. We were told this by Father Serankua. All the sacred sites protecting nature are untouchable. Teyuna (in this sense, specifically the Lost City) is the owner of tumas and of the granting of names and of sewa (the small stone symbols of traditional knowledge). Teyuna has a part to play in the world. If Western society wants to have sewa, if they want to work well and help the natives of the Sierra Nevada, there are stones that we can provide. Teyuna is the owner of the Earth, and these stones are the property of Teyuna. They cannot be collected by anyone but only by those in charge. Tourists are gathering these stones and we say to them that they do not have authority to do that. The sea also has stones and shells that we can gather. All the rivers that flow to the beaches come from eizuamas. These rivers must not be damaged or they cannot carry anything down to feed the sea. The clouds are raised down there to complete the water cycle to the peaks. The lagoons are the Mothers of the sea and they supply its needs. The daughter of the lagoons is the sea, and like a daughter it supplies the lagoons through this cycle of the water. We thought that the Younger Brothers were going to take care of the seas, but we must say that fifteen years ago they constructed Corelca (an electricity generating plant) with great damage to the sacred sites. Everything that exists in the nature needs to be purified in the sea, but the Younger Brothers do not want to hear that these are sacred sites. They built towers there and we cannot enter to gather our shells. It is not possible to repair the damage that the Younger Brothers have done to the sacred sites. The Mother cannot survive this. So we now see the rivers drying out, avalanches, landslips, drought, unfamiliar weather, and all this is being brought about by the Younger Brothers. We can no longer feed nature with its ancestral sustenance, so the Parents no longer exist. That is the deep concern of the Mamas and Elders. We must hold divinations concerning these droughts and avalanches, and I believe that they are caused by the destruction of these sites. There used to be different species of birds here, but nowadays there are almost no birds. Already there are no traditional foods. Previously we took care of Nulkujaluwa and the sea without help. Now the Mother cannot be defended by us alone, nor the Heart of the World. But as we said, we must take care of these Mothers, these sacred sites. We Mamas have analyzed that you may not destroy the hills, but many sacred sites have been destroyed, cut into, and constructions erected over them. Can the Mother’s existence continue? We know clearly what we have learned from the Elders, but nowadays we do not have the knowledge that they possessed, and this is a source of weakness. For example Goltuje (a scared hill now irrevocably damaged) was the place from which sprang the life of trees and rivers. Perhaps we did not work hard enough to make the Younger Brother understand. But we think that nature is going to support us so that the Younger Brothers understands us. Nowadays we communicated with the Younger Brother through the Organisation Gonawindua Tairona. That is why we created it and the whole Mountain range can be encountered through the Organisation Gonawindua Tairona. This is how we can express our ancient knowledge of how to take care of the world. In the beginning the Elder Brothers remained here while the Younger Brothers were sent to the other of the sea, with everyone instructed to protect the mother. To this we can add that the President also has his staff of authority and must himself take care of nature according the laws over him, laws that support us. But nowadays we see that the laws that protect ethnic groups are not respected. The State says that it has the right to the resources under the earth. But these are our resources. This creates distrust between us and the Younger Brothers, and between the Younger Brothers themselves. The state is not obeying its own law or the Original Law. In the Ministry of the Environment they say that they are the owners of the environment, but they do not fulfil their duties towards it, and we know that we must make our offerings. The Environment Ministry does not do the work that we do, but wants to use these resources. They do not know how to do the work, but the Mamas know how to pay with offerings. We Mamas know the function of each site, but the Younger Brothers do not listen. All this has been the cause of avalanches, destruction and massacres. This affects the Younger Brother as much as us. New diseases are appearing, travelling from place to place. Through the jatukua (divining bowl) and sewa, the very stones of eizuamas, nukualula, the stones and the planets are denouncing this, not us. We must warn the Younger Brother of the danger. Dugunavi (another damaged sacred site) is the person who has to take care of the sea, so she is a Mother too, and we must take care of the sea just as of the Earth so that it produces fish, shellfish and everything. We human beings are her children. Dugunavi… is slowly fading. The Organisation Gonawindua Tairona and their Cabildo exist to make public declarations about all this since the Mothers cannot take care of things unaided. The Organisation Gonawindua Tairona alone can authorize people to visit or to know the Sierra Nevada, with the help of the Mamas. But really the decision is made by the eizuamas,. Today `people want to know something of our culture and we can teach the knowledge of how to dance, to touch drums, to spin, to remove mague, to sing to all the things and the foods, and to Nukuajula. We hold all this knowledge in the palm of our hand. That is true of the four peoples of the Sierra Nevada. We cannot forget that we are not the only natives in the Sierra Nevada. We have different languages and ways of doing things, but we have a single soul and heart to take care of nature and we share this duty. I do not believe that any native from any other country is not going to take care of nature. We must stand united before all who present themselves to us. It was a long struggle to create a single organization and a leader to represent the eizuamas. Not self-appointed, but a leader that was named by Nulkujaluwa and by the mountains. That is why other bodies have recognised that the indigenous people of the Sierra Nevada have maintained their traditions, and that through their efforts they have create the Organisation Gonawindua Tairona and a leader who helps to maintain our traditions. Without this, people would climb mountains and what grows there would be damaged at every elevation, high, medium and low. But the armed groups are going up and are affecting what grows. They destroy the stones and sacred sites that are homes to the Fathers and Mothers of everything. They do not know what these mountains are and the growth of plants there is being damaged. Aracaha rots now, because people have walked over its site of origin. And they remove stones of the Mothers there, ignoring the fact that Gonawindua is the heart of everything. The damage has begun to appear in nature. We have consulted in jatukua (divination), and after deep analysis we concluded that we must take protective action. We cannot stand by and hope that things change for the better, but we must act to protect future generations. Since we are all children of nature, the Mamas are worried, and we are the ones who take care of all that is below and above. The sites are disappearing, and the Mamas do not want this. That is our view, but what does Younger Brothers think? Everything in the Sierra Nevada exists in relation to material objects like tumas, and the jatukua says that we must meet at Seishuwa or Takina (the places of these meetings) to protect everything from this stripping away. So we must unite with all the eizuamas to speak with a single voice. Who can help us and replace what has been taken? This did not happen before the arrival of the Younger Brother. The Conquista was a bitter outrage and today seems just as terrible. They have begun to dig up the stones. The eizuamas are not the sea and beaches, but people there feel what is happening. The sun is their owner and sees tumas as its children. So we must inform the Younger Brother. We have asked if any of us are taking away the tumas, but we are not. We know that we cannot play around with such things. The Mamas have seen what can happen, so we must ask the whole nation, what can we do when the day grows dark? This is a sign, and our artificial light will give us no illumination: the sun is the Father. Why do the Younger Brothers show no respect? They only show respect for anything when necessity forces it. If our Brothers do not listen and harm us…. They could give us so much help. FARC is now eating our crops and eating plants which may not be eaten because they are Mothers of the plants. Also they have begun to sleep in places where nobody can sleep and to smother the Parents of the waters. Our Elders foresaw this. The Mamas are not speaking out on their own initiative, but the sites themselves have begun to ask for this support. The eizuamas used to be places where the Mamas alone held council, but now people simply walk wherever they want. There are sites where no-one can go, but now people move freely through them. They have always been required to ask permission to go to sacred hills. These are sites that the Kogi of the Sierra Nevada believe may not be walked without permission of the Mama. You can only go there to make offerings, and only with prior permission. The mother suffers when people go without permission. Walking in the Sierra Nevada, the shequita (guerrillas) are like burning rays that damage everything that grows. This not only affects plants, but animals too. All the hills warn of the danger. Before the Mamas thought “Where can we go to stop this?” We do not have sewa to use arms and we cannot carry them, we can only carry the poporo. We have never hunted for treasure nor taken apart sacred sites, because they are sacred and to be able to take anything from them it is necessary to consult with the jatukuwa and to do the appropriate work (in aluna). We have not spoken clearly to the Younger Brother. We want to know who authorized the destruction of the sacred sites on the coast. We continue our work in the sacred sites. The Younger Brother have places to make laws, such as Congress. You cannot play around with nature, and in Bogota there are important sites like eizuamas. Do they not know that? Perhaps the laws of the State can say that looting tumas is not allowed. Who gave permission to the armed groups to walk the Sierra Nevada? If they were like us, we could ask them, like a Head of State. We wonder if the President has given authorization, or is it the sun that has given authorization to these groups? The avocado trees and some streams have dried up and we do not know what to do. FARC also entered the nuhue and cooked in it. We may not cook there, that shows a lack of respect. This is why elders like Mama Valencia are dying, as the eizuamas suffer. And the eizuamas are being polluted with rubbish, which also affects them. Now we understand that the guerrillas are not part of the State, but they are engaged in militarizing the Sierra Nevada and the army too is going to the sacred sites of the Sierra Nevada. What is more, on the shore also they are using dynamite to kill many fish. Is that allowed? This situation does not only affect us, but everyone in the world, even the English on the far side of the sea. This is what is being said by the Nukuljula. Our life depends on the constant cycle of water moving between the sea and freshwater lakes and rivers.. When we behave properly, this is the centre of the world, and the good rain falls on everything that grows. If the sacred sites are overthrown we would have nowhere to live. For example Jukul-wa (a scared site on the shore, now the site of industrial development from which the Mamas have been barred) does not exist all by itself, but is part of a network of connected sites. As for the jasinkuna (stones in the sacred places), they watch over the eizuama, like human guards, and throwing down or moving these stones is harmful. We must physically occupy the sacred places We have had many meetings and decided that we must take our places in the eizuamas and in the sacred sites by the sea so that we may fortify them. That is why we decided to seat ourselves in eizuamas, like Jukul-meji. We had wanted to occupy these sites earlier, but the armed groups made it impossible. This is how we are giving this message. We are speaking out at Suguluw, at Sankona and other eizuamas that we are going to protect. We know that there is a law that protects all eizuamas. The Sagas and the Mamas are of one mind on this subject. We want to transmit this message to the Western world. The whole community and the Mamas are of one mind. Mama Valencia despaired at the occupation of the sacred sites, and he died. What are we lesser Mamos to do confronted by this situation? The police have not respected indigenous law or the great Mamas like Ceballos, Jose, Don Juan and other great Mamas. We do not know who is going to fall sick first, but we are expecting pandemics, and because these are manifestations of the sickness suffered by nature itself, it is going to be hard to find drugs that can cure the coming sickness. All eizuamas agree with this declaration. We are not used to commercialization , but now even the shells on the beach are bought and sold. Our sacred sites, such as Jukul-wa, are not part of the commercial world. We have always respected what is sacred. We cannot go freely to these places and these sacred sites cannot be bought and sold. This is not a new message, we have been saying this for years. Ah… The world may begin to tremble. Now that we are seated here we can ask what is the best way to protect the sacred sites. We are here in this place because it is not just any place, but that the one that is going to give strength to us in our work, not only in the face of the Western world, but internally among ourselves. The history of all the Parents is shaped and recorded in the eizuamas. We cannot leave our eizuamas to take care of themselves, because other people will come and harm them. Now we are acting on the national stage. We are aware of our rights, and we say so publicly. Many people may come seeking our opinion, and this is what we say. There are species in nature for which we must dance so that their life can go on. Everything that exists must have rules. Every place in the Sierra Nevada has a door, but it seems that they do not respect this, they all want to know the thought of the Mamas. We ourselves must control this. This is the vision of the Mamas and it has been so from long ago. If we had not seen what is happening, we would not be speaking these words or inviting people from other places to hear us, and speaking to the State. What is happening is “a massacre of the sites”. To take out a stone is just like taking out a person. Nowadays our work in eizuamas is isolated. There are Younger Brothers who did not separate themselves, but we are evaluating our work and activities. Each one of us seated with a jatukuwa, we are engaged with the task, the laws and the norms. 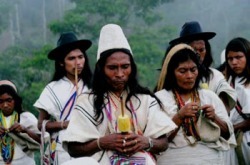 We communicate with the Wiwas and Arhuacos (The other indigenous peoples of the Sierra). Here the Kogi Mamas have set out their proposal, and the Arhuaco Mamos accept the Kogi proposal. The Wiwa too will accept it. This is what will happen. The four indigenous people of the Sierra Nevada all use the same physical poporo. The Wiwa and Arhuaco Mamos are in agreement with this proposal. We used to think that the Cabildo could solve the problems of the Sierra Nevada, but now the Cabildo asks the Mamas to present their words themselves. Now we can be understood by Western people through the Organisation Gonawindua Tairona and the Cabildo. Nobody can enter the high part of the Sierra Nevada without permission because that will bring sickness. That means that not even the Cabildo can go to the higher regions without permission. He must go first to San Miguel, then Takina and Makotama. That is all spelt out by the eizuamas. In the Kogi world, the position of Cabildo is granted by the authority of the eizuama. Elder Brothers never had to request permission to go to Jukul-wa, but now they do, and they were stopped with anti-riot police and tear gas. Nothing happened to us but these attacks were a violent assault against our thought, and stopped us proceeding with the spiritual work that we went to do in Jukul-wa. We must be able to go there freely. It seems that they are not going to allow to us to continue visiting Jukul-wa, and this is an attack on the Mother. We did not use arms. Although these people want to harm us, we are not going to shut up and go away. We are going to continue with our practices and with visiting this site. I will take the lead here in continuing our work. Negative forces are going to continue to grow stronger, so we ourselves must continue working positively so that the consequences can be averted. We must work together with the Younger Brother, and now that species are disappearing we must explain what is going on. This is happening because they are acting against the sacred sites that are Owners of these species. This is what we know from our long analysis, and we must not only show this to the Western world, but to other indigenous peoples. They must decide what they must do within their own territories. Each one of us must decide what we are going to do. More and more indicators appear, like the birth of deformed children, as sacred sites are interfered with. That is our thought and this above all we will continue saying to the world. This is why we were born and live and this is what we declare. We invite other indigenous people and all people in the world to grasp the situation in which we now live.